Where’s Wallis? 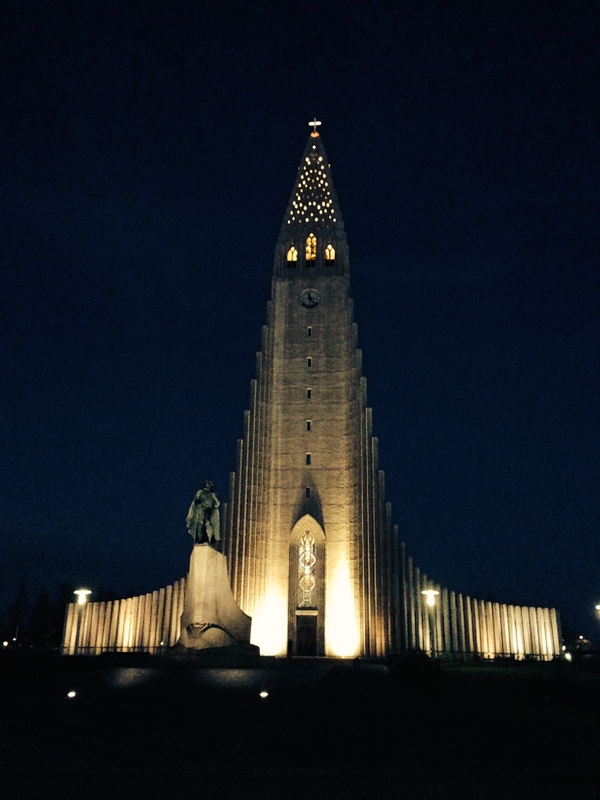 Reykjavik, Iceland – Where's Wallis? Most people come to Iceland and don’t stray from Reykjavik and the surrounding area. Understandable, since there are easily enough activities to pack a long weekend, but be warned you’d be missing out on some fantastic sights around the island. 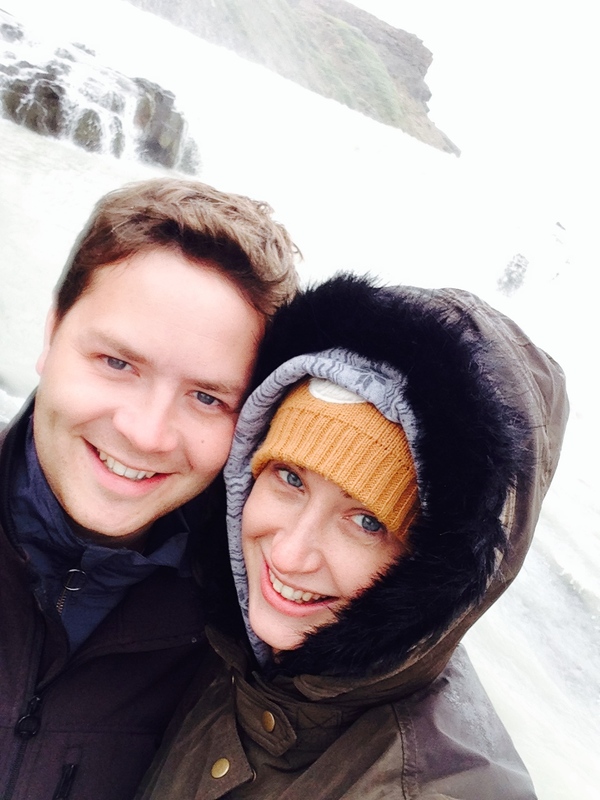 I’d booked to come to Iceland for 11 days to visit sister Iona, and I’d manage to convince a begrudging James to join me for the first 3 days of the trip in Reykjavik before he had to head back to a wedding in the UK. He was baffled as to why anyone would choose to go to Iceland for their summer holiday. I unknowingly passed on the fib that Iona had told me that “It’s summer….it’ll be 25 degrees”. It wasn’t. It was about 10 degrees. 15 at a push. Apparently it was due to start snowing in 2 weeks! 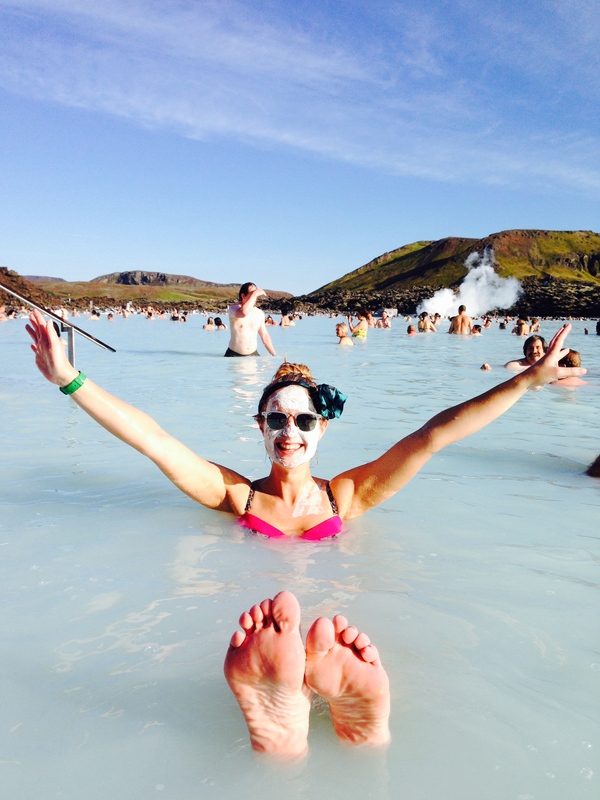 If you’re a sun-lover, then maybe Iceland isn’t the destination for you. But hopefully the next 3 posts will convince you why you must add it to your ‘to visit’ list. In his organised style James left booking his flight until about a week before, despite my ‘friendly reminders’. As there are only 2 ‘Wow-air’ flights each week day from the UK to Iceland this meant that they had sold out on the day I was flying, so he headed out the day before and got the lay of the land. Wow-Air and Iceland-Air both offer free stopovers on flights from Europe to the US of up to 5 days – definitely look into it if you’re making a transatlantic trip anytime soon. We booked to stay in an awesome little AirBnB flat right in the centre of Reykjavik. In the interest of fitting in as much as possible, once I had landed on the Wednesday afternoon, we went straight from the airport to the Blue Lagoon as it is en route into Reykjavik. Some people choose to do it the other way and pop in on the way home, but I don’t think it would be particularly relaxing basking in the lagoon constantly checking the clock to see if you need to dash for your flight. And flying back with sulphur skin. 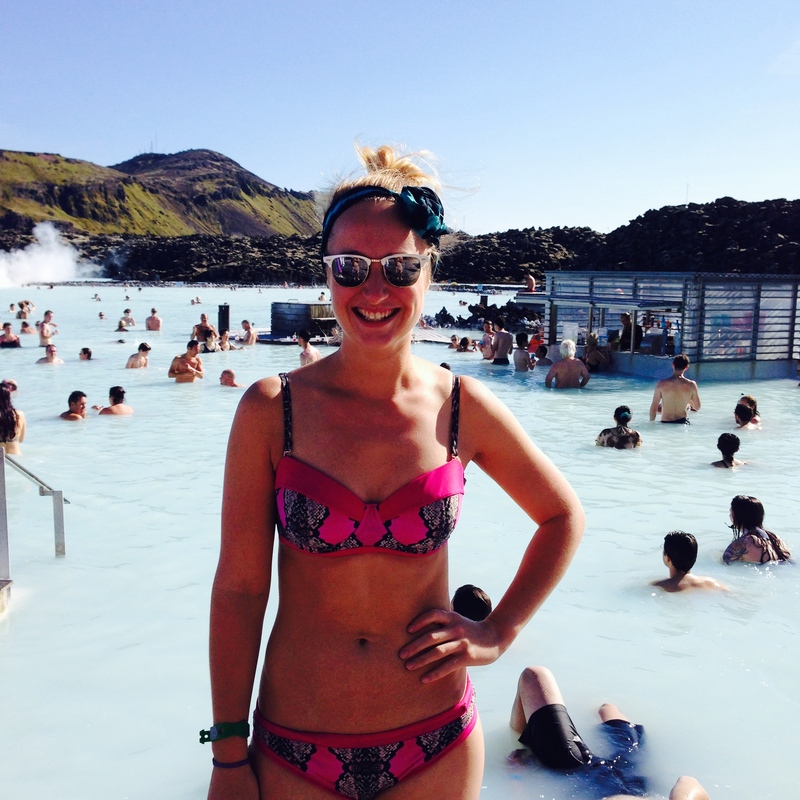 It’s best to buy tickets in advance for the Blue Lagoon. It is a bit of a pricey excursion, and there are plenty of other cheaper/free thermal baths around Iceland. However I’d still recommend a visit. 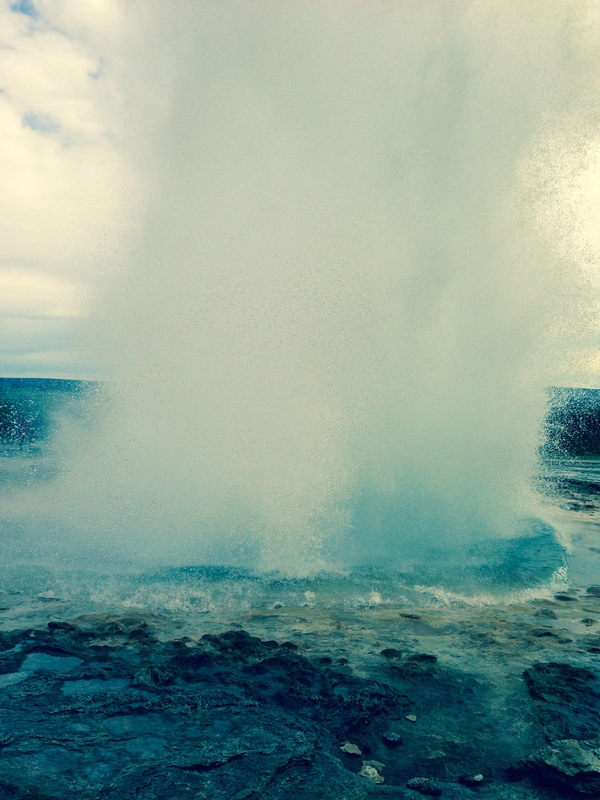 When you buy your ticket you can book a bus to/from the airport or Reykjavik. What I would NOT recommend is having a massage there. I’m always a sucker for a massage so I signed up and trotted off whilst James chilled with a mud-mask and a beer (beer cancels out the femininity of the mud-mask, obviously). It was a truly bizarre experience. They put you on a floaty mat in the middle of a little pool, then cover you with a towel to keep you warm. I was uncomfortably hot. Then every 5 minutes they would suddenly plunge the mat below the water, unannounced, in order to fill the towel with more warm water. I had to crane my neck to avoid my head being submerged, making for an experience that was far from relaxing – less spa, more waterboarding! 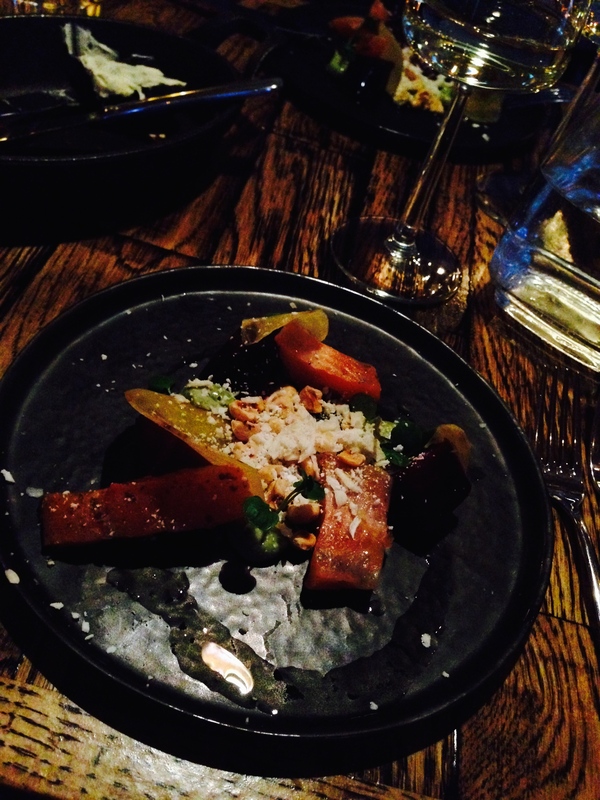 That evening we went for the first of our delicious dining experiences in Reykjavik at a restaurant called Kol. I have to admit I didn’t have the highest expectations for food in Reykjavik but Kol was DELICIOUS! We splashed out and got the tasting menu with paired wines and it was absolutely fantastic food and drink. Excellent cocktails too. Arctic Char at Kol. I thought that the waiter said Chard! Pre-dinner we did a little bar crawl along the main pedestrian street, and after dinner popped up for some culture at the cathedral. The next day we had a big day out to the ‘Golden Circle’ around Reykjavik and then diving/snorkelling in the afternoon. We booked with ‘Dive Iceland’ who were fantastic. We were picked up early in the morning and driven out with a group of about 10 of us (and an amusing guide!) 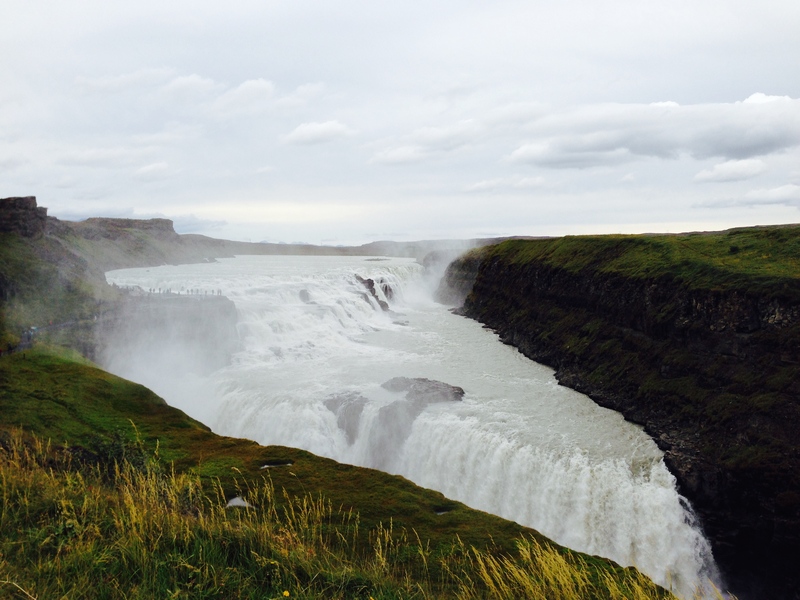 to see the Geysir and Gullfoss waterfall. Jane (Deloitte colleague who I spent this NYE with in Vegas) had raved to me about the lamb soup – with free refills! – at the cafe at the top of Gullfoss. So before we went to see the actual natural wonder, I forced James to sit in the cafe and have about 4 bowls of lamb soup with me. It really was good. Apparently the apple pie is also a must try! In the afternoon we were driven to Thingvellir national park where Iceland’s first parliament met (and game of thrones was filmed). 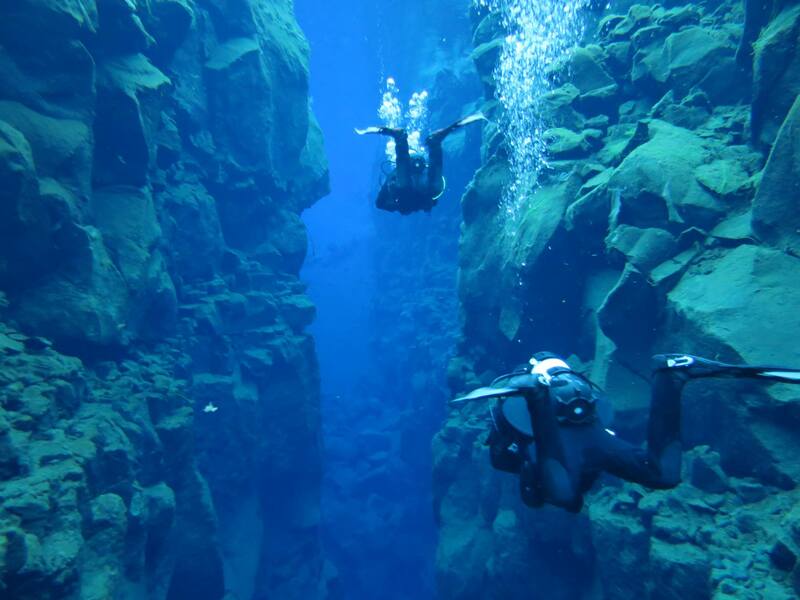 Our dive/snorkel took place in the Silfra fissure: this is where the North American and Eurasian tectonic plates are pulling apart, and you can swim along the middle! The water doesn’t contain many plants or animals, but it has some of the best visibility in the world (over 100m). Got Europe to the left of me. North America to the right. The water was about 2 degrees when we went in, meaning we had to wear drysuits – like a wetsuit except instead of a layer of water being heated by your body it’s a layer of air, with super tight seals around the neck and arms so that no water gets in. They were SO weird. The instructors kept reminding us not to pee in them. Apparently it’s a common issue that people forget when they’re in the water, and then when they get out and remove the suit they have an embarrassing wet patch. My housemate Rachel went in December and her hair froze once she got out the water! 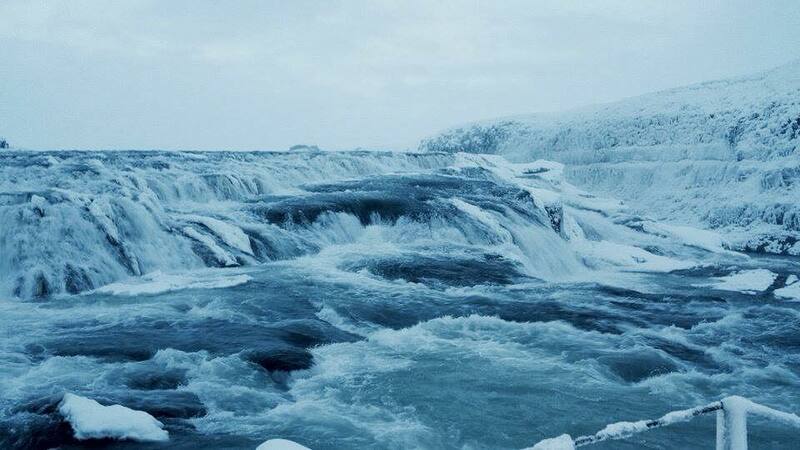 I definitely want to go back to Iceland in the winter as I think it’ll be a totally different experience. We spent about 45 minutes in the water, once we emerged we had beautiful botox-style ‘fish lips’ as they were the only things exposed to the water (we had gloves and booties on). We proceeded to drink our body weight in hot chocolate before heading back to Reykjavik. 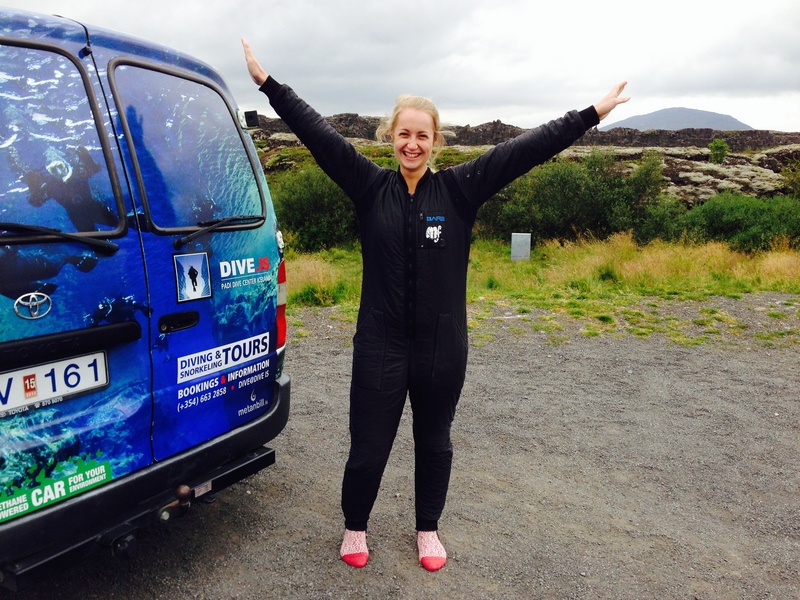 Diving was was another expensive excursion (to be honest that’s anything you do in Iceland!) but well worth it for the experience! That evening we went for a scrumptious meal at Grill-Market. The sister restaurant to ‘Fish-Market’, which I’d heard excellent things about however they serve whale on the menu. Which Iona well and truly drilled into me that one shouldn’t eat! 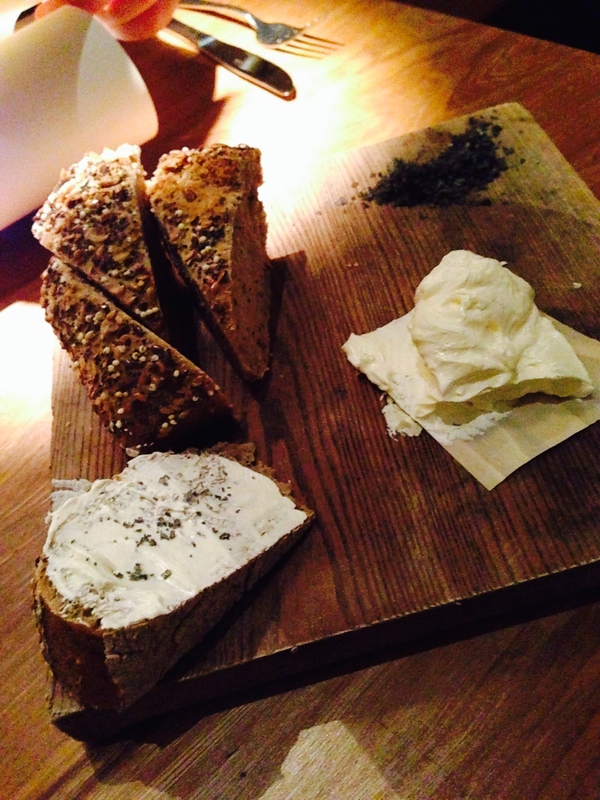 The Icelandic restaurants all served whipped butter with their soda bread, accompanied with pepper and lava rock salt. Drool. The next day we had MORE ACTIVITIES! 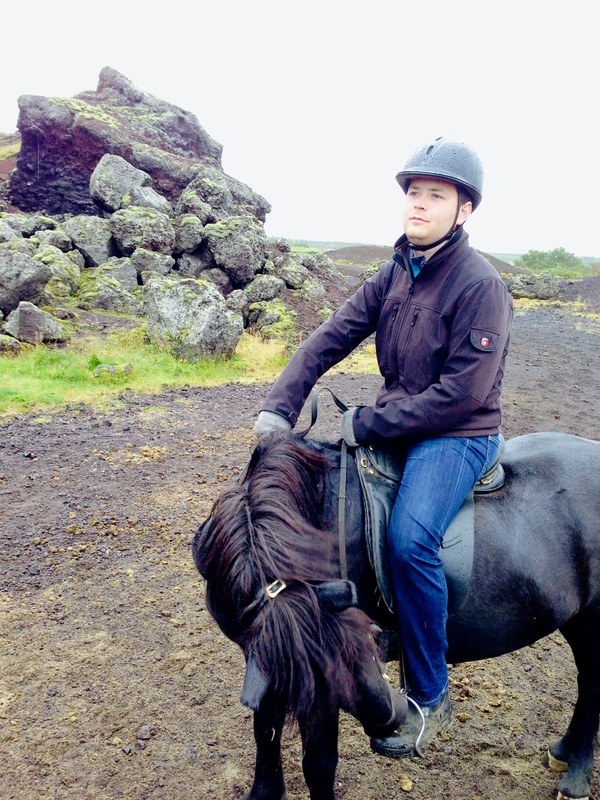 Icelandic horse riding! 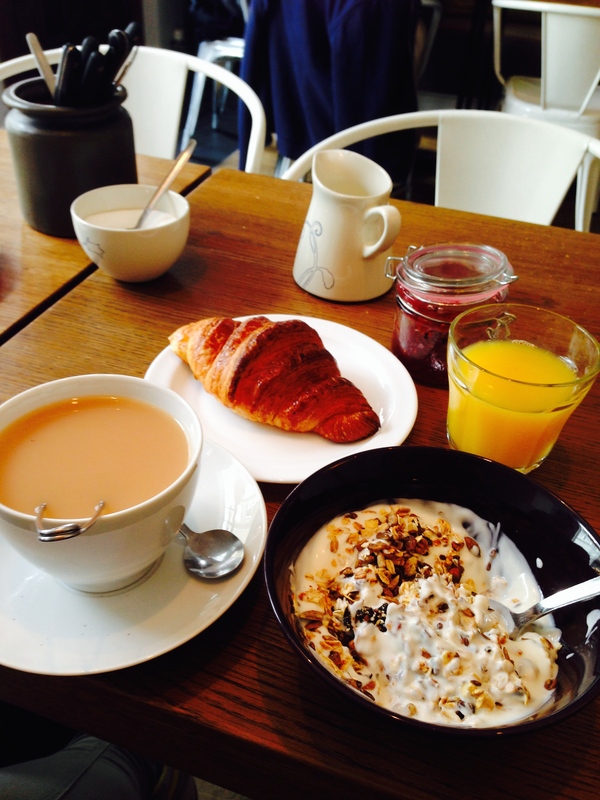 But not before a deluxe breakfast at Sandholt Bakery. They have no diseases in their horse population, therefore don’t have to inoculate them, meaning that no horses from outside Iceland are allowed in, and if you want to take your horse out of Iceland for a competition you can never bring it back. Tough! 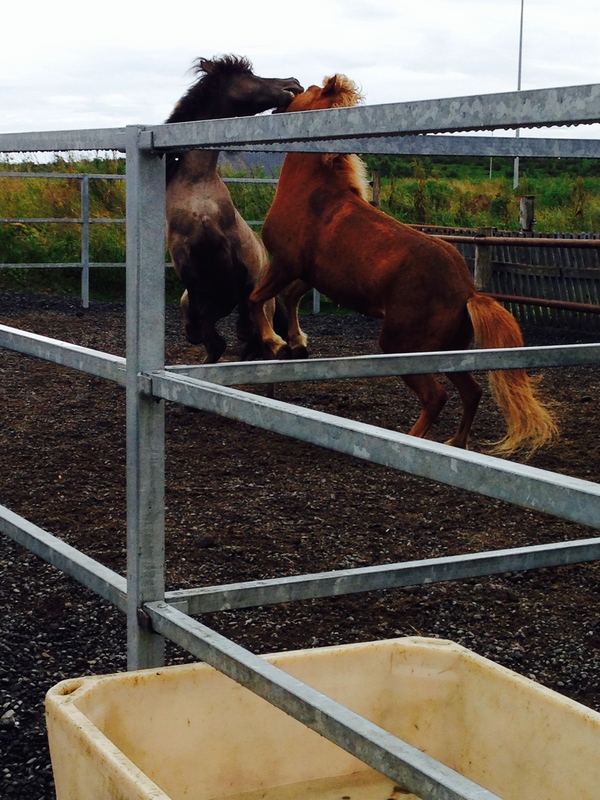 We went to ‘The Icelandic Horse’ which was absolutely fantastic. Begga (‘Becca’), the host was so passionate and knowledgable about the horses and we had a great ride through weird lunar terrain – still within Reykjavik city limits. When we got back into town we had an outing to the ‘Lobster Hut’ down by the Harbour, followed by 2 hours of scheduled relaxation time and then dinner with my mum and sister. 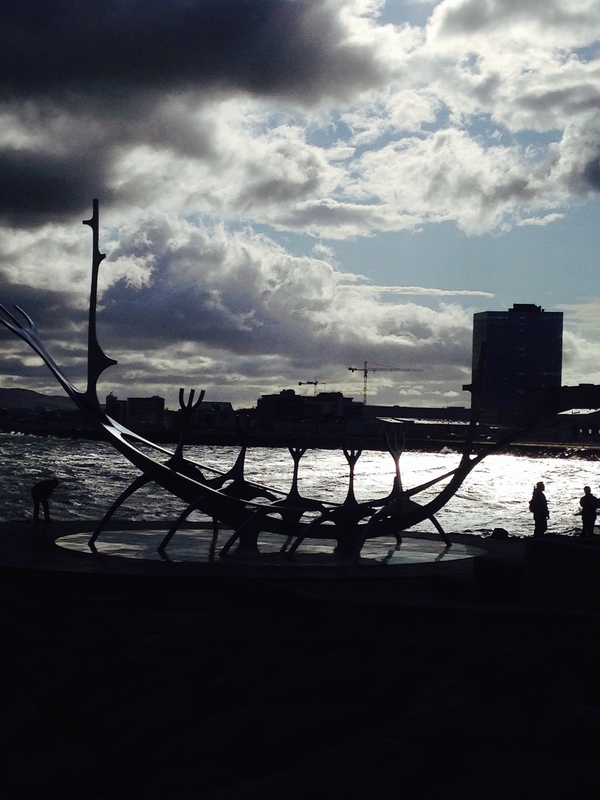 Mum had been visiting Iona the week before up in Husavik so we all crossed over for one night in Reykjavik. 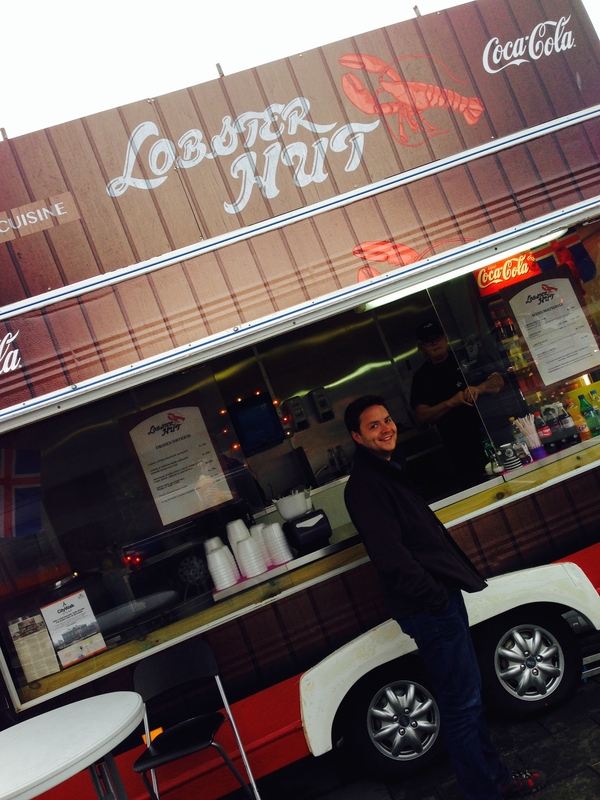 Of course he sniffed out a lobster hut the day before I arrived! The next day James headed to the airport at the crack of dawn and I went to pick up my wheels before Iona and I set off on the drive up to Husavik. 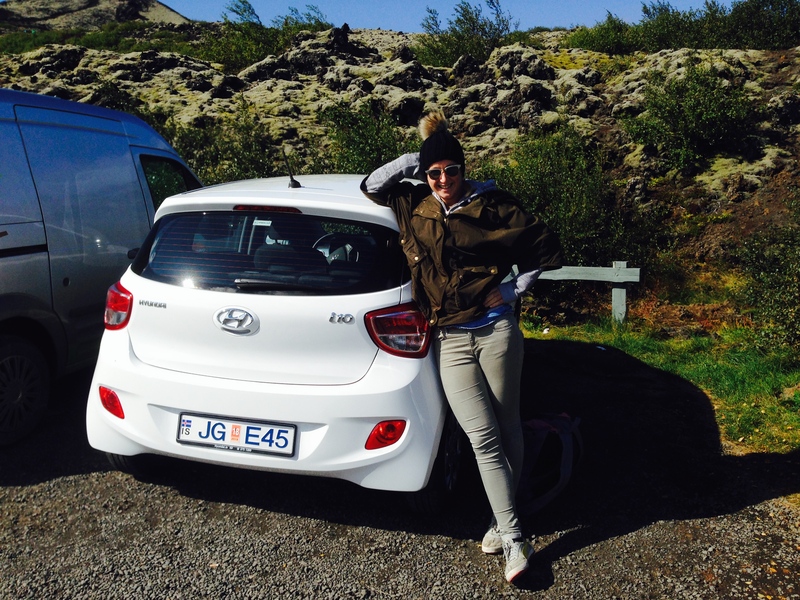 I spent a LONG time researching car hire in Iceland. Mainly trying to work out why it was so bloody expensive!! 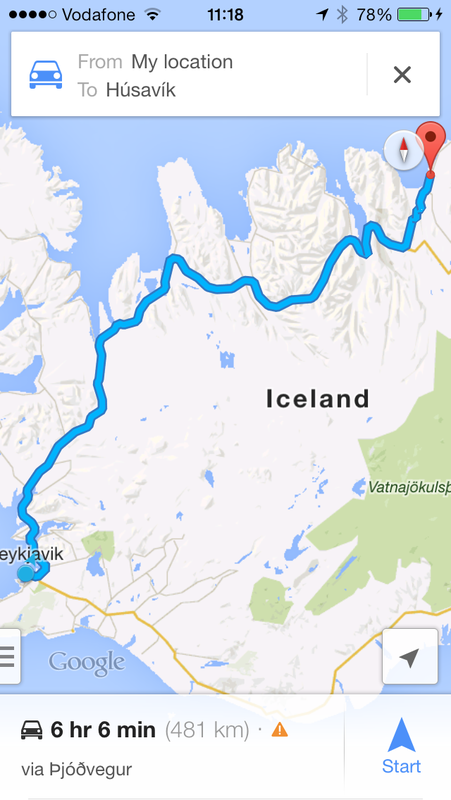 To put things into perspective, my 21 days of car hire in California this Christmas cost the same as 6 days in Iceland. I did some googling and forums suggested that ‘Sad Cars’ was the cheapest provider. I just could not bring myself to hire a car from ‘Sad Cars’, so ended up booking through ‘Holiday Autos’, whose depo was conveniently at the bottom of the road that our AirBnB was on. Then there was the issue of insurance. Usually car insurance is relatively simple right? You just worry about yourself, and about other drivers. 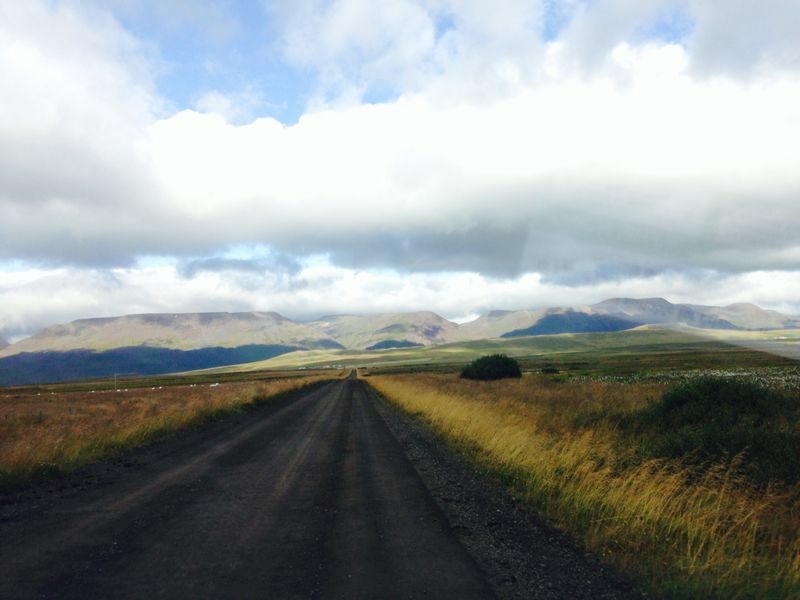 Well in Iceland you also have the risk that volcanic ash poses, and of course the risk that gravel poses (since other than the route 1 ring road around the island, most of the other roads are gravel!) In the end I went for the gravel cover, which I was very glad I did, and ditched the volcanic ash cover, thinking that if a volcano exploded whilst I was driving past I’d have bigger issues. One I had the car and insurance sorted, the next issue was, well, the driving!! Having not driven since I passed my test aged 17 (except one ‘incident’ with a streetcar and some whiplash which we won’t talk about here) it may have been rather ambitious for me to commit to driving about 1300km on the ‘wrong’ side of the road. Got to back yourself though, and in the end all went well. 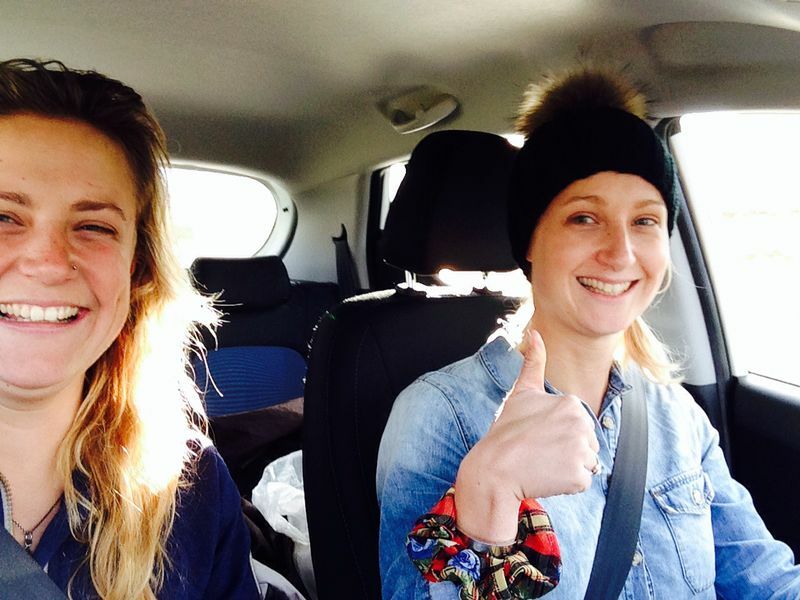 I was very glad to have Iona as a travel companion, as the original plan was for me to drive from Reykjavik – Husavik alone. 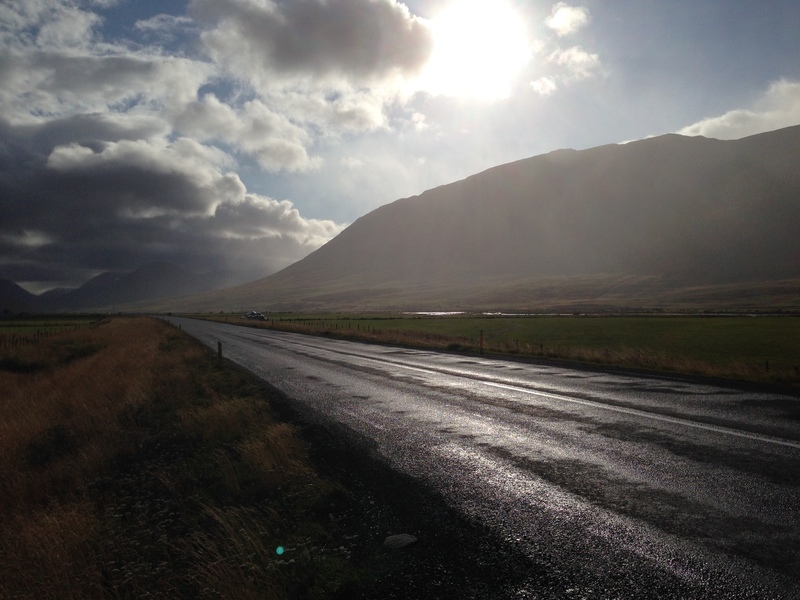 Key tip if you’re driving around Iceland: stop for petrol whenever you can! The stations can be 200km or more apart, and many appeared to be closed. They have a very bizarre system where you have to guess-timate how much you’re going to spend filling up in advance, and if the tank is full on less than that then tough. No refunds like in the US. So make sure you take your calculator with you – I suppose they’re still trying to boost the economy! 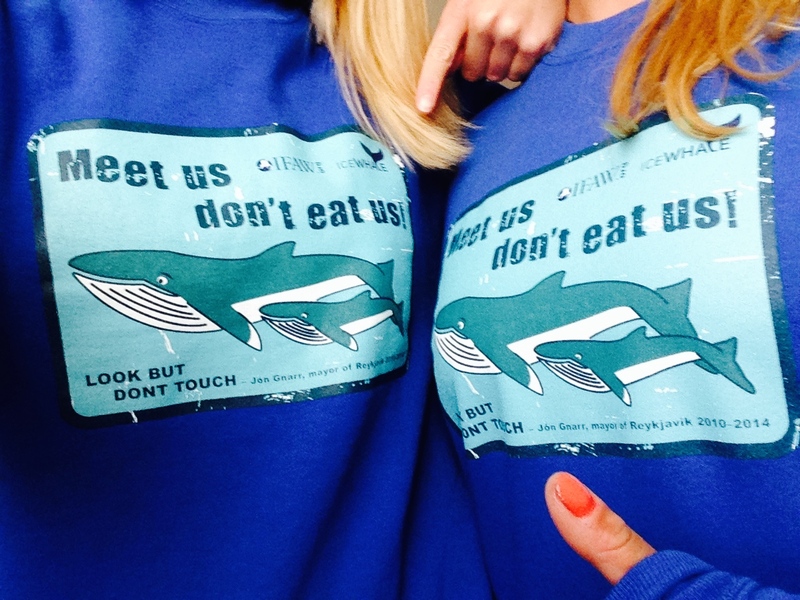 Over and out for now but we’ll pick up in Husavik with the whales and a cheese-tub hot-tub!